Homeopathy Heals Sports Injury Quickly! Contact Us For Help Homeopathy For Athletes and Sports Injury. Maintain Your Peak Athletic Performance! With homeopathy and proper nutritional supplementation help maintain sports performance both physically and mentally. If you are in pain, or with worry or anxious about an injury, an upcoming competition, the lost playing time – this can be very discouraging to a competitive athlete. 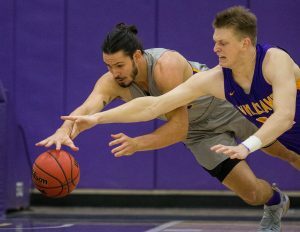 Lukas Swidler (grey), a long time user of homeopathy for his athletics, dives for the ball for California Lutheran College. Homeopathy is a 200 year old natural medicine that has been used by millions of people world wide. It is proven clinically to be safe and effective. All homeopathic remedies are made from natural substances and proven on healthy people for the hundreds of healing benefits. Homeopathic remedies are produced under strict pharmacopia guidelines. Remedies are easily available at your local health food store in the lower potencies or through Homeopathic Remedies Online. Homeopathy is clinically proven to produce fast healing results! It promotes natural healing because it is not suppressive. Homeopathy does not stop your body from doing anything – or suppress symptoms. Instead is SPEEDS UP the natural healing process. Our athlete clients who use homeopathy have shorter down times and faster healing cycles. They get back faster to the basketball court, the football field, the weight room, the soccer field, the ice rink, the dance floor or the pool – competing in their sport! Sport injuries that are not properly and effectively treated can result in surgery. Suppressing pain with pain killers on injured or torn muscles or pulled ligaments or tendons does not help them HEAL – it only suppresses pain. When surgery becomes necessary for any sports injury, by using homeopathic remedies, broken bones will heal faster, Muscle tears will mend more quickly. Head injuries and head concussions will heal and long term tissue damage is avoided. Homeopathy not only heals sport injuries quickly, but it also can be used as a preventative medicine. Our website offers valuable homeopathic remedy guidance for all athletes of ages and abilities in all types of sports. We offer resources on supplements for athletes. Our free, helpfulinformation and resources will help athletes like you heal from sports injuries and achieve your best – with homeopathy! What Homeopathy Is….and why it works. How To Dose A Remedy.…either dry or in water. How To Treat Basic Sports Injuries.…quickly and affordably. Nutritional Supplements To Take….for optimal performance. This website is published by Kari J. Kindem, CFHom, CHP, Classical Homeopath and Sport Injury Specialist, based in San Jose, CA. Read testimonials about Kari’s practice and experience in a wide variety of health issues, including homeopathy for high performance athletes! Contact Us For More Assistance with Your Sports Injuries! Please contact us for professional guidance if you need help deciding which remedy to use, how to dose a remedy or if your sports injury is beyond the scope of this website.